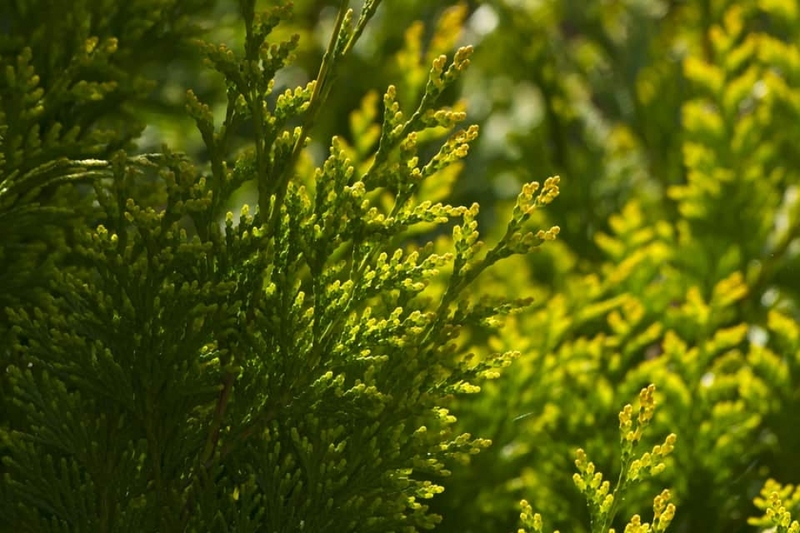 Chamaecyparis (Chamaecyparis): growing, planting, caring. Chamaecyparis - common names cypress or false cypress - is a genus of conifers in the cypress family Cupressaceae. Chamaecyparis are medium-sized to large evergreen trees growing from 20–70 m (66–230 ft) tall, with foliage in flat sprays. The leaves are of two types, needle-like juvenile leaves on young seedlings up to a year old, and scale-like adult leaves. The cones are globose to oval, with 8-14 scales arranged in opposite decussate pairs - each scale bears 2-4 small seeds. Chamaecyparis are happy in colder regions - as they handle frosts as low as -20°C. They prefer well-drained, cool soil in full sun or partial shade. Plant in late autumn or winter, in unfrozen soil, during the dormancy of the plant. Plant in a hole at least twice as big as the root ball. Soak the roots in water before planting, it should improve the chances of recovery. Get your Chamaecyparis in containers preferably, rather than in clods or bare roots. Keep a hollow around the base, it will serve as a water reserve during the first months. Tamp the soil well around the roots (do not hesitate to use all your bodyweight). Water until the hollow is full, and the level decreases very slowly (at least two watering cans). After planting, water abundantly but not too frequently, so that the roots will fetch water deeper. Water thoroughly until the soil is wet and a small puddle forms around the tree. Roots can even dry out in the winter : it's therefore suitable to water until the planting basin is full and only empties slowly. Trim hedgerows in spring and September, trees in winter. The pruning is done with shears or hedge trimmer preferentially, it avoids being able to cut branches too old (and to make irreparable damage), and allows a regular result. Chamaecyparis need to grow slightly to regenerate their foliage, so give them at each new trimming 1-2 centimeters extra. Mulch the base of your chamaecyparis the first year, it will save you the hassle of watering too much and weeding too!